Probably the most well maintained Sanlorenzo 82 currently on the market is now available for sale. 4 cabins version, low engine hours and fully optional. 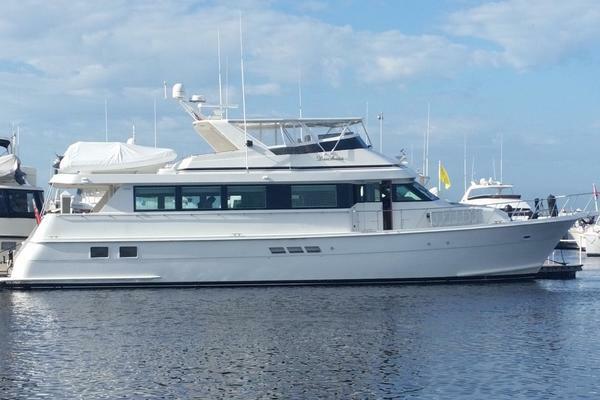 United Yacht Sales New Jersey would love to guide you through a personal showing of this 78' Sanlorenzo Sl82 2006. This yacht for sale is located in Unknown France and priced at $1,450,000. For a showing please contact us by filling out the form on this page and we will get back to you shortly! Anfemais powered by highly desirable CAT engines with less than 500 hours. The main deck is well suited for dinging and entertaining with 2 wine coolers and a day head. The lower lobby layout features a family area with a large comfy sofa, plus roomy master and VIP staterooms and a twin stateroom. “Experienced Yachts” is a project that Sanlorenzo has tailored for the yachts traded-in from its customers, aiming to deliver the boats in flawless condition for their new owners. Each yacht is surveyed, reconditioned and managed according to the RINA “Refitting and Maintenance Quality Assurance” (RMQA) regulation. The RMQA represents a perfect guide line to guarantee the efficiency and the immaculate condition of structures, onboard machinery and systems, furniture, and manuals/documentation. All experienced yachts are managed in one of two marinas located in La Spezia. Once refitted, the boats undergo daily, weekly and monthly “duties” to ensure status and efficiency. Sanlorenzo guarantees that all stages of the management process will be registered, from boat assessment to delivery. One-year warranty covering the entire yacht, regardless of brand and age A second year of warranty is extended to Sanlorenzo yachts covering GRP structures and onboard systems (excluding main engines and generators). This is available to those Sanlorenzos built not earlier than 5 years from the Purchase date and have been participating in the “Free Service” program.